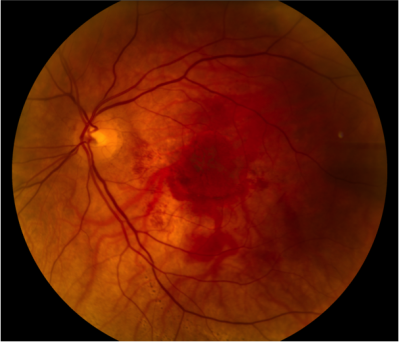 The breakthroughs in vision research and treatment we are helping to pioneer are substantial. 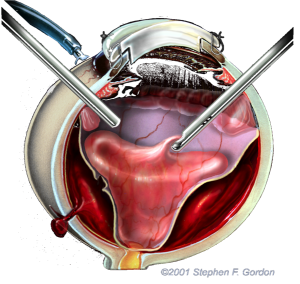 Several procedures have been developed that have resulted in restoring eyesight to some individuals who had lost it through disease or trauma. 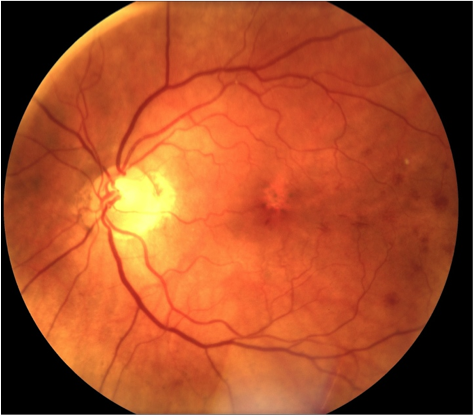 In addition, we are exploring new ways to bring rehabilitation services to millions of people who are affected by low vision. 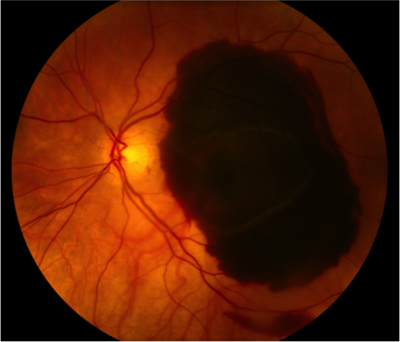 From researching diseases such as glaucoma and cataracts, to studying how scar tissue forms in the eye, we are discovering new treatments through partnerships with researchers worldwide. And as the Foundation continues to grow, programs designed to foster similar hearing loss treatments will be developed. Every day brings new advances, and every breakthrough brings new hope. 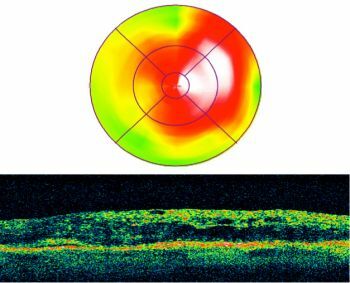 When these research breakthroughs are fully implemented into patient care, the Foundation is confident that millions of years of lost eyesight will be saved, and that cost savings to public health and productivity will have been made for pennies on the dollar. That is the power of the modern biomedical research era that began in the 1960’s, toward the end of Helen Keller’s life. Figure 1. 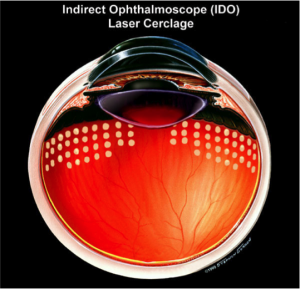 Peeling the Internal Limiting Membrane (ILM) of the Macula (the human center of vision). ©Stephen F. Gordon. Figure 3b. 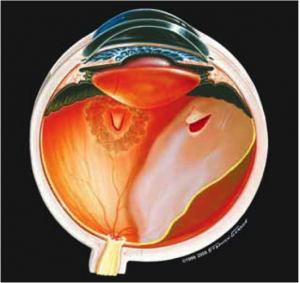 Ora Secunda Cerclage (OSC) – non invasive laserspots prevent retinal detachment in high risk eyes. ©1999 Stephen F. Gordon. Figure 4a. 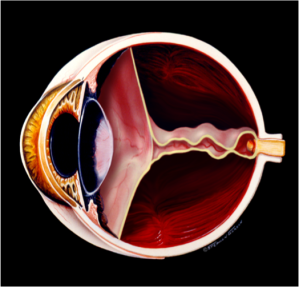 Scar tissue detaches the retina, pulling it to the center of the eye.©Stephen F. Gordon. Figure 4b. 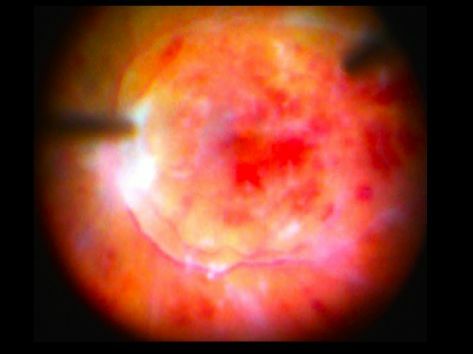 Actual photograph of PVR scar tissue injuring the retina. Figure 5a. 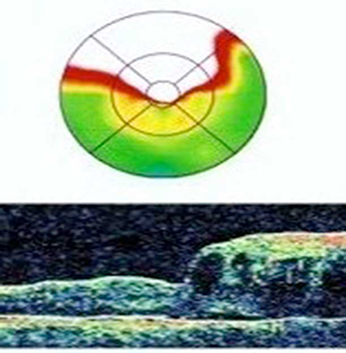 Preoperative image of a swollen center of vision (macula), visual acuity 20/60. Figure 5b. 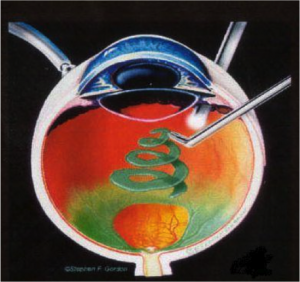 Four years postoperatively, the macula is still dry and reading vision is restored to 20/20. Figure 6. 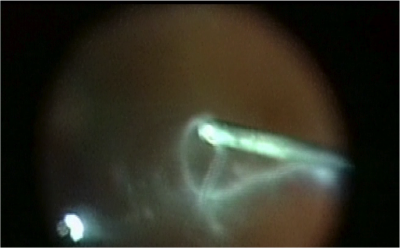 A photo captures cloudy vitreous “floaters” being removed by vitrectomy. 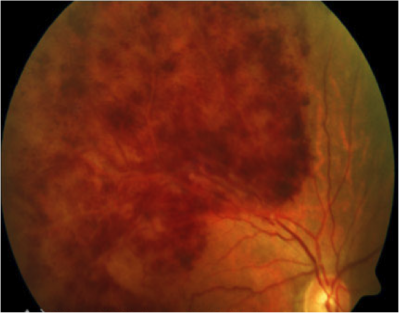 Second only to diabetic retinopathy, Branch Retinal Vein Occlusion (BRVO), or a stroke of the retina, is the most common form of blood vessel problems affecting the eye and causing vision loss.7 The macula, the human center of vision, is severely injured in most cases of BRVO (Figure 7a). 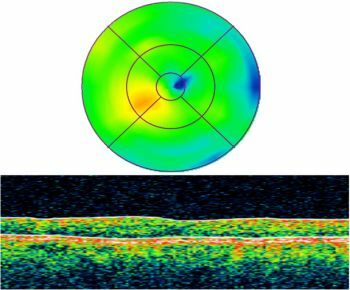 Helen Keller Foundation researchers have developed a laser-based surgical technique that permanently cures severe macular swelling (edema) after BRVO, usually returning macular vision to near normal (Figures 7b and 7c). Figure 7a. 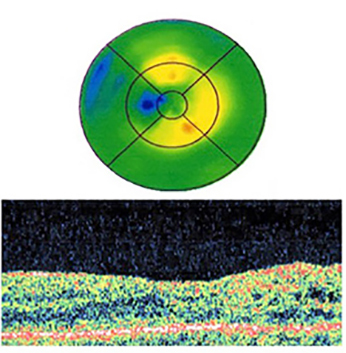 Fundus image of affected retina in BRVO. Figure 9b. 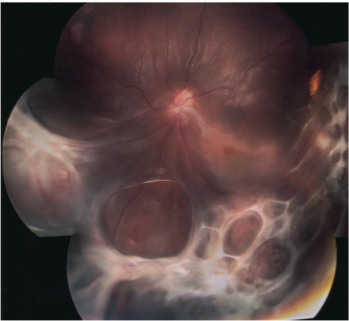 Image of clear fundus 3-weeks postoperative.